No I didn’t make that up, but I can’t think of a better way to say that as an Internet Marketing Professional it’s essential to have the right tools for the job. In preparation for our Excellence & Innovation Conference this week in Miami, I will be sharing a variety of my most useful tools that my team uses to give our clients a competitive advantage. 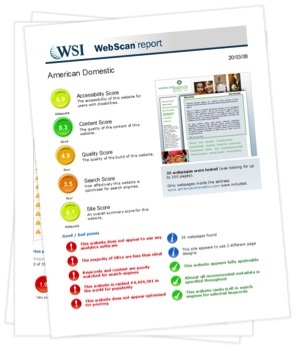 In particular I want to highlight one of my favorite analytical tools, the WSI WebScan™. Individual tests cover many areas, including spelling, broken links, speed, optimization of keywords and much more – over 30 tests in total. The technology behind WebScan was originally developed for FORTUNE 100 companies to test thousands of high-profile websites worldwide. WSI has since acquired exclusive access to this technology and made it available to our clients. WebScan is now used to test over 10,000 websites each month in over 10 countries. The technology continues to be used by a huge range of websites, from corporations to small businesses, and is updated monthly with the latest in best practice. All of our consultants are familiar with this tool, but I will be sharing unique ways to utilize the data in combination with other tools that I will be highlighting to the network. If you would like to see a sample WebScan™ or request one, contact your WSI consultant, or just click here.